New York, Dec 9 (Just News) : The number of Rohingyas who fled to Bangladesh from Myanmar since August 25 has now risen to 646,000, a big jump from the estimated number of 626,000 last week, says the United Nations. Although this is a jump from the estimated number of 626,000 we had earlier this week, the rise is due to a better assessment, said Stephane Dujarric, Deputy Spokesman for the UN Secretary‑General quoting his colleagues at the Office for the Coordination of Humanitarian Affairs (OCHA). Dujarric, quoting the World Health Organization (WHO), said diphtheria is rapidly spreading in camps in Cox’s Bazar. As of today, more than 110 people have contracted the disease, with six fatalities. Most of the people affected are children, he said in a press conference at the UN headquarters on Friday. The WHO says people must be relocated immediately to limit the spread of diphtheria. It is working with the Health Ministry (of Bangladesh) and other partners to scale up prevention, said the Deputy Spokesperson. Routine immunizations targeting children up to the age of six began on Saturday and older age groups cannot be immunized currently, due to a shortage of vaccines, according to the UN office. 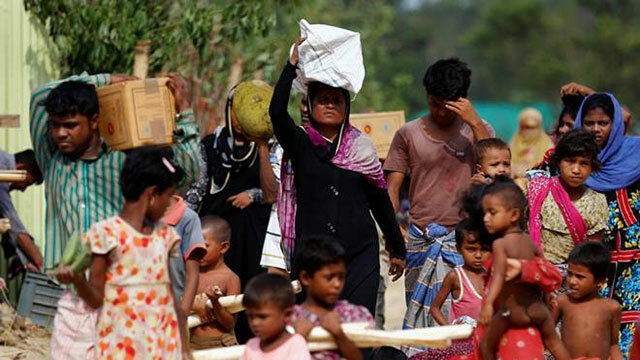 The Deputy Spokesperson said their colleagues at the UN Refugee Agency (UNHCR) said they are arranging to have talks with Bangladeshi authorities over an agreement between Myanmar and Bangladesh, which was signed last month, on the voluntary repatriation of Rohingyas. As UNHCR has previously said, all refugees have a right to return, but this should happen voluntarily and only when people feel the time and circumstances are right. And as you recall, the UN was not a party to that agreement, Dujarric said. The UN Refugee Agency on Friday said Rohingyas living in Bangladesh will need accurate information about the conditions in the areas of their origin and ultimately, their decision about their future must be their own well-informed choice. Many of their homes and villages have been torched and destroyed. Deep divisions between communities remain unaddressed and humanitarian access is inadequate. It is critical that the returns are not rushed or premature, said UNHCR spokesperson Adrian Edwards at a press briefing in Geneva. At present Rohingyas are still arriving in Bangladesh and restoring peace and stability, ensuring full humanitarian access as well as addressing of the root causes of displacement are important pre-conditions to ensuring that returns are aligned with international standards, said the UNHCR. The mass flight of Rohingya Muslims from Myanmar’s Rakhine State has created a humanitarian catastrophe and serious security risks, including potential cross-border militant attacks, said an international group on Thursday. The international community should press the Myanmar government to urgently implement the Annan commission’s proposals, including as regards discrimination, segregation and citizenship, according to the International Crisis Group (ICG).